Johns Hopkins University Press, 9781421423210, 256pp. 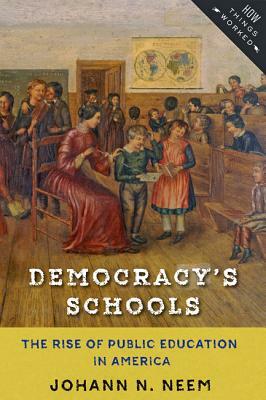 At a time when Americans are debating the future of public education, Johann N. Neem tells the inspiring story of how and why Americans built a robust public school system in the decades between the Revolution and the Civil War. It's a story in which ordinary people in towns across the country worked together to form districts and build schoolhouses and reformers sought to expand tax support and give every child a liberal education. By the time of the Civil War, most northern states had made common schools free, and many southern states were heading in the same direction. Americans made schooling a public good. Yet back then, like today, Americans disagreed over the kind of education needed, who should pay for it, and how schools should be governed. Neem explores the history and meaning of these disagreements. As Americans debated, teachers and students went about the daily work of teaching and learning. Neem takes us into the classrooms of yore so that we may experience public schools from the perspective of the people whose daily lives were most affected by them. Ultimately, Neem concludes, public schools encouraged a diverse people to see themselves as one nation. By studying the origins of America's public schools, Neem urges us to focus on the defining features of democratic education: promoting equality, nurturing human beings, preparing citizens, and fostering civic solidarity. Johann N. Neem is a senior fellow at the University of Virginia's Institute for Advanced Studies in Culture and a professor of history at Western Washington University. He is the author of Creating a Nation of Joiners: Democracy and Civil Society in Early National Massachusetts.